Dental hygiene is an essential aspect of keeping your pet healthy and happy! Similar to what our human dentists recommend, we urge our clients to brush their pet’s teeth daily and to bring them for yearly dental cleanings. Poor dental health affects every internal organ in an animal’s body including the heart, kidneys, and liver. Dental procedures require anesthesia, but when done on a routine basis the procedure is quick, less expensive, and the health reward far outweighs the risk. Please ask your veterinarian to discuss routine dental care at your next visit! 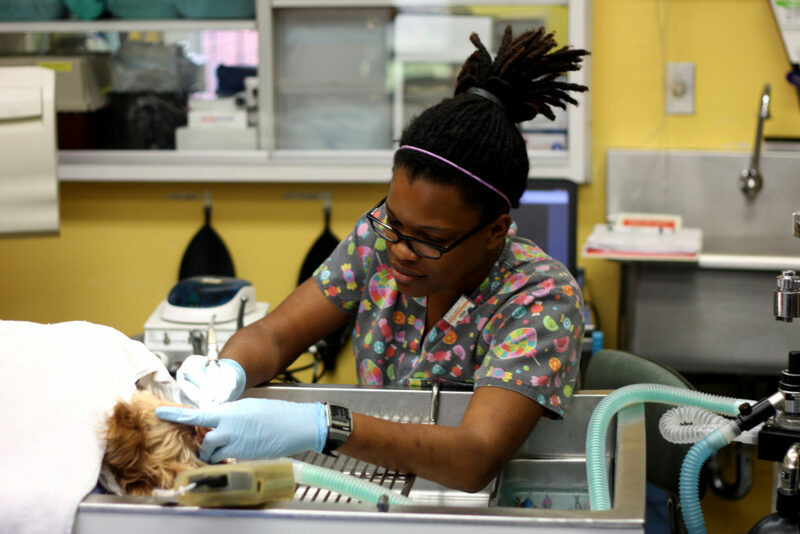 Dupont Veterinary Clinic is proud to offer the highest standard in veterinary dentistry practices including high speed dental equipment, digital radiography, regional nerve blocks, and surgical extractions. Our veterinarians are trained by a board certified dentist and are highly experienced in dental diagnostics and dental surgery.